The movie Hangover II has opened and may enjoy a good box office this Memorial Day weekend. In the first Hangover, three friends give their buddy a wild bachelor party in Las Vegas, thereby encountering a multitude of problems. One critical issue concerns the misplacement of their buddy. The friends spend most of the film trying to locate him prior to the impending nuptials. During the friends' misdirected quest, they encounter Mike Tyson's tiger sleeping in their hotel bathroom. This is actually a good thing since the tiger is the cause of the friends' meeting with Mike Tyson, who was prominently brandishing a large facial tattoo. Part II continues with the friends' pursuit of further intoxicating high jinx. 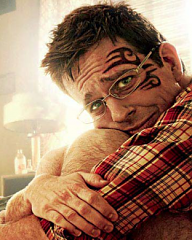 The new film also prominently features a tattoo on actor Ed Helms' face. The tattoo appears very similar in design, location and size as the Tyson tattoo, although there are some apparent differences. Wherein lies the problem, according to the tattoo artist S. Victor Whitmill, who claims that the Helms' tattoo is an infringement of the tattoo he designed and affixed to Big Mike's face. So, this being America, where a federal lawsuit can be filed for a court fee of $350, Mr. Whitmill filed a copyright infringement action against Warner Bros. in federal court in St. Louis. 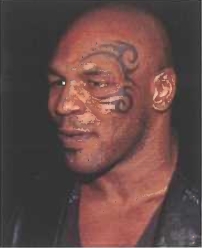 He sought to enjoin the release of Part II to preserve his copyright interest in the Tyson tattoo from claimed irreparable harm. The court declined to enjoin the release of the new film, but news reports suggest that the court did not think much of the Warner Bros. defense. This will all be sorted out in time. This case raises several interesting issues in copyright, just as Part II raises interesting issues in filmatic humor, I'm sure. One question present in the case tests whether copyright protection can -- or should -- extend to an image indelibly and permanently affixed to the human body. After all, Big Mike walks around town, perhaps with his tiger, meeting people while emblazoned with the permanent and public face art. If someone takes his photo, can this be infringement? If Big Mike appears in a motion picture, can this appearance (and the resulting display and distribution of the tattoo) be infringement? Indeed, Mike appeared in the first Hangover film and no lawsuit was filed by Mr. Whitmill. Is affixing to the human body sufficient for purposes of satisfying the fixation requirement of copyright? And if it is, should it be so? Should there be a human body fixation exception? Does copyright in a permanent aspect of a human body travel too close to the law of right of publicity? Are the exclusive rights of copyright too strict, notwithstanding fair use principles, to allow for first amendment protection when the human body becomes the walking canvas? These are but a few, I'm sure, of many more interesting copyright questions relating to human fixation. A second question concerns the role of David Nimmer. He is both the present author of Nimmer on Copyright (written initially by his father Mel), a law teacher at UCLA and a practicing attorney with the firm of Irell and Manella. Mr. -- Professor -- Author Nimmer gave a declaration in behalf of Warner Bros. and in opposition to the preliminary injunction. In the declaration, he explains that he once believed that work can be affixed to the human body to satisfy the fixation requirement, but that he changed his mind years ago. Fair enough, he has the right to change his mind. But it appears that the current version of Nimmer on Copyright continues to posit that a work can be protected by copyright if affixed to the human body. See, §1.01[B], fn 392 (“For a tattoo may presumably qualify as a work of graphic art, regardless of the medium in which it is designed to be affixed (in this instance, human flesh)”). So, Nimmer takes one position as an authority in his treatise, but takes a contrary position in his declaration as an advocate for Warner Bros. in this case. At least, that is the appearance. Is Nimmer's true role that of a scholar or advocate, and how can anyone tell? Should his legal position on this issue be consistent notwithstanding the several hats he wears? Indeed, is there now a hint of suggestion that the perceived independence and authority of the Nimmer treatise is called into question? Was President Lincoln the First IP President?